Ted Mosby: Singles tables are cruel. I mean what if you went to a wedding and there was a table of all fat guys? Marshall Eriksen: That would be awesome. How I Met Your Mother has known to be quite an emotional comedy. I've watched every episode, and most of them even twice, and there have been many, many times where it's gotten more than just laughs out of me. Sometimes it's made me happy, sad, and scared. Sometimes it's filled my heart up. And I don't really know how to describe that emotion, but it just fills my heart up and leaves me feeling warm. More than once it's made me cry. People criticize this final season and I see why, but I've enjoyed it all. I've enjoyed this show in its entirety. And I wouldn't change a thing. Since the legendary episode "How Your Mother Met Me", this show has rallied up nearly every type of emotion in me. I've cried probably in every episode, my hearts been filled up, I've laughed, I've been sad. It's scared me. And for those of you who follow these forums you'll understand what episode I'm talking about. When Ted chokes up. Yeah, that *scared* me. This comedy show has scared me because it's managed to create these characters that I've grown to love. This show . . . this show is incredible. All of its nine seasons are amazing. Most people think of it as a romance, even I think of it as a romance, and sure it's a love story. But it's not just one. It's multiple love stories. And this show isn't only a love story, no. It's about friends and family and following your dreams. I was hesitant, as many others were, about this episode. Why bring back Gary Blauman? Most viewers don't even remember who he is. Even I had to look him up as a refresher. But that's just another slightly brilliant thing about this season. 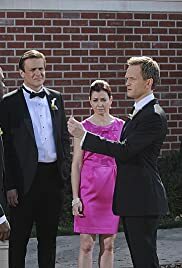 It's moments before the wedding, and someone that they all had an experience with shows up, and I guess what I'm trying to say is that everybody comes into your life for a reason. This show proved it. Gary Blauman didn't play even a slightly big part in any of the character's lives, but he played a part, and any part is important. That happens to me every now and then. I'll run into someone I maybe talked to at a party, but I remember them. I don't know what I'm trying to say with this review, what point I'm trying to get across, but people are important, and this episode told us the stories of all the minor characters that we've forgotten about, but realized that we still cared about them. This show is brilliant. It's romantic. It's plain amazing. And this episode brought me to tears. The scene that Ted and the Mother share in the end - that filled my heart. This entire episode did. Bays and Thomas have spent 200 episodes creating these characters and this show, and they've been doing it with an end in sight. They knew from the beginning what they wanted us to feel in these last few episodes. And boy is it working. They're using all their tricks. I can't wait to see what the next three episodes have in store.